Does pain and suffering have a limited cost? 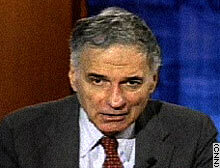 Consumer advocate Ralph Nader: "This is a medical malpractice crisis. Over 80,000 Americans, 220 every day, die from medical negligence. Hundreds of thousands are injured." WASHINGTON (CNN) -- President Bush renewed his call for a $250,000 cap on pain and suffering damages for victims of medical malpractice on Tuesday as funeral services were held for 17-year-old Jesica Santillan, who received the wrong heart and lungs in an operation last month. Is Jesica's family's pain and suffering worth $250,000? Consumer advocate Ralph Nader and Dr. Donald Palmisano, the president-elect of the American Medical Association, joined hosts Paul Begala and Robert Novak on Tuesday to debate medical malpractice changes. NOVAK: Ralph Nader, there are states in crisis ... where doctors are going out of business because they can't afford the medical malpractice rates. ... They're big states [such as] Florida, New Jersey, New York, Ohio, Pennsylvania, Illinois [and] Texas. This is a real crisis that lawyers have perpetrated on America, isn't it? NADER: Another one of your leading questions. This is a medical malpractice crisis. Over 80,000 Americans, 220 every day, die from medical negligence. Hundreds of thousands are injured. And the insurance companies -- which had relatively steady rates on doctors for about 10 years -- have found its investment income, its interest income and the stock market collapse down. And so they're jacking up the rates on a few key specialties like obstetricians and neurosurgeons. But if you take the entire amount of premiums, Bob, that's paid by doctors in this country to malpractice insurers and divide it evenly, they'd be paying less than $9,000 each. That's one-third of what they pay a receptionist. NOVAK: That runs against the fact that so many of them are just leaving their practice because they can't afford it. You know, Ralph, you and I often agree on some things and one thing I think we agree on is the dirty effect of money and politics. Can you say that the trial lawyers who appoint millions and millions of dollars into Democratic coffers in order to keep this, do you believe that this is healthy? Dr. Donald Palmisano, American Medical Association: "What we need is a system that's fair to everyone, a system that keeps the physicians in practice and allows patients to have access to physicians in their hour of need." NADER: Well, as much as they've poured into those coffers, it's much less than what the doctors, the malpractice insurers, the hospital chains and the HMOs and the nursing home chains have poured into members of Congress' coffers. This is first and foremost, Bob, a question of equity. Are we going to allow severely injured people who have found a lung taken out is the wrong lung or a double mastectomy that wasn't indicated that was inflicted on a woman in the Midwest, or that organ transplant that was incompatible on that 17-year-old teenager in North Carolina? Are we going to say to these and so many others, you can't have your full day in court? The Congress is going to handcuff the judges and juries in the United States at the state court level. I haven't yet met one senator or representative who's for this bill who has demonstrated that the judges and jurors in their home state are incompetent, unwilling or unable to perform justice in these medical malpractice cases. And I've never heard one person say that the insurance executives who make $250,000 a week, every week without any pain and suffering, no one is saying cap those. BEGALA: Dr. Palmisano, there was a hearing on Capitol Hill [Tuesday]. And, I want to ask you to respond to one of the witnesses [who] testified. John McCormick is the father of a 13-month-old girl, who he said died because of medical malpractice. He said that the hospital ignored abnormal CO2 levels in her blood. Said that the attending physician had slept through several pages. She died awaiting surgery. Listen to what Mr. McCormick said and I'll ask you to respond. MCCORMICK: Mr. President, from father to father, my family's pain and suffering are not frivolous. BEGALA: Isn't he right? ... President Bush says these guys have won the litigation lottery. Does that look like a lottery winner to you, holding a picture of his dead baby? PALMISANO: Well, the current medical liability system is affecting patients in that they can't get access to care. The American Medical Association works very hard to make safety a priority in the medical care system. That's why we founded the National Patient Safety Foundation. The current system doesn't measure negligence. It measures disability. And what we're finding now is that the emergency rooms are closing, trauma centers are closing, pregnant women can't find a doctor to deliver the baby, a boy knocked unconscious has to be transported to another state. Another witness today told of what happened to her husband because there were no longer neurosurgeons available in the community. The patient had to be [airlifted] and by that time it was too late to prevent the brain damage. BEGALA: Those are important points, I don't doubt. BEGALA: But I wonder if you can respond to Mr. McCormick's point. Who are you [and] who's our president to tell him that his suffering is only worth $250,000 for the loss of a child? 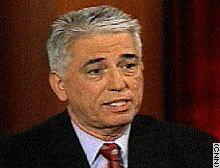 PALMISANO: Well, what has to be done here is balance. What we need is a system that's fair to everyone, a system that keeps the physicians in practice and allows patients to have access to physicians in their hour of need.